If you’ve ever thought that one person can’t make a difference, we encourage you to read this interview with Gerald “Jerry” Sager! A lawyer originally from South Dakota, Jerry was a major force behind the 2014 passing of South Dakota’s SB 75 which bans breed specific legislation on the state level. South Dakota joins 17 other states that now have preemptions in place, which prohibits municipalities from passing breed discriminatory laws. Best Friends Animal Society recently released this video about the legislative process for two recent preemptions, including South Dakota. You can watch that here. Jerry did a great job researching stakeholder issues and laying the groundwork before the bill was introduced. The National Canine Research Council consulted with Jerry prior to the bill being introduced and they connected us to him for an interview because he’s a terrific example of how concerned citizens can make a BIG difference! Can you tell us a little about yourself? How did you get involved in working for the BSL preemption in SD? 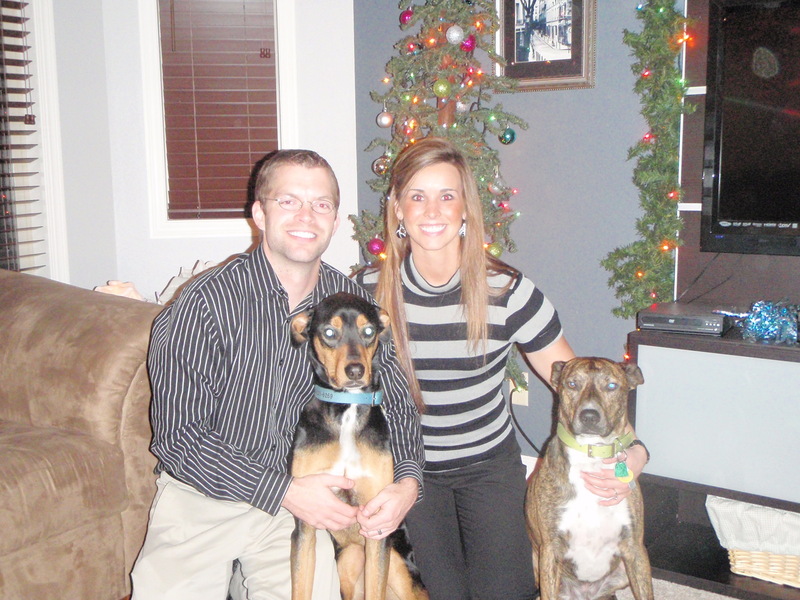 My wife and I owe the new South Dakota law to our “pit bull” dog mix, Chip, and our Doberman mix, Jeter. We adopted Jeter from the local humane society and, one day, while on the way to law school class, I found Chip on the side of the road. Then, not long after finding Chip, the town of Aberdeen, SD talked about a pit bull ban, and that is when the idea of a law prohibiting Breed Specific Legislation (BSL) came to us. I researched that idea and learned that other states already had such a law. In November of 2011, StubbyDog ran an article about us that gives some insight into why and when my wife and I began to pursue this endeavor. How did you get this particular process started? Once my wife and I became fixated on the idea that people in government can enact regulations that ban and/or significantly adversely affect the owner(s) of a certain or perceived breed of dog, we began to thoroughly research everything that has to do with the issue. We researched everything we could think of, such as dog bite statistics, how dog bite statistics come about (what data/information is used to generate dog bite statistics), what type of effect do breed bans and other forms of breed specific legislation have and are they or are they not effective in reducing dog bites. We wanted to learn every argument there is for breed specific legislation, and we wanted to know every argument against breed-specific legislation. We knew we couldn’t be successful in getting a law passed prohibiting breed specific legislation if we didn’t know the facts ourselves, so we read and watched every resource we get ahold of, such as online resources, relevant books and magazines, and videos. In addition, we also researched what certain relevant organizations, like the American Veterinary Medical Association, have said regarding breed specific legislation. We also looked up the wording of the statutes of states that at that time had a law prohibiting some form of breed specific legislation. Every resource proved to be very informative, especially the data compiled by the National Canine Research Council, Animal Farm Foundation, and Best Friends Animal Society. You knew it would be important to engage all the stakeholders prior to the legislative session. Can you explain how you did this and why it was critical to the success of the bill? We couldn’t have been successful if it weren’t for the certain people who have been working on this issue for a long time and gathering and putting together the needed information that we used to help backup our position. Eventually, we brought the idea of the bill that would prohibit breed specific legislation to a few legislators. Through my work as a legislative intern in 2006, I am acquainted with a few legislators, so I reached out to some of them hoping to get a feel for what kind of response such a bill would receive and to see if any of them would be receptive. There was one Legislator who got the bill typed up and visited with quite a few legislators in 2013. But in the end, we got the sense that there was a lack of knowledge of the topic of BSL and general misconceptions. The legislator suggested we hire a lobbyist. But we were already a quarter into the 2013 legislative session and up against the deadline to introduce bills, so we ultimately decided not to propose the bill. It was a tough decision, but we were told that if we did propose the bill and the bill was defeated, then it would be nearly impossible for the bill to ever have success in the future. In addition to reaching out to certain legislators, we also reached out to other individuals and organizations throughout South Dakota who we thought might be supportive and influential. We contacted local animal shelters, veterinarians, the South Dakota Veterinary Medical Association, animal control, and a dog behaviorist. These are local individuals and organizations that are considered experts and whose stance, one way or another, would likely be impactful. Fortunately, pretty much everyone we contacted said they and/or their organization was supportive of our bill. At this point we decided not to propose the bill during the 2013 legislative session and to gear up for the next legislative session instead. In 2014 I went to Pierre, SD and spent a week at the capitol visiting with legislators about the potential bill and letting them know that they would have an opportunity to vote on the bill during the upcoming legislative session. I knew that time was limited when visiting with individual legislators, so my wife and I created a colored brochure that explained the bill, what it would accomplish, and its importance. Later, I sent a personal letter to each legislator. For the legislators with whom I personally visited, I thanked them for the opportunity to visit and for the legislators with whom I did not get the chance to visit, I explained why I was at the Capitol, included a copy of the brochure, and mentioned that I was looking forward to working with them in the upcoming session. You wound up hiring a lobbyist. In our experience, this isn’t always a necessity, but it did make the difference in this situation. How were you able to secure the funding to take this approach? Following the time at the Capitol the next step was to find the lobbyist. We eventually found a lobbyist who was a former South Dakota Attorney General, and respected amongst the legislators. Acquiring the funding for the lobbyist was a little difficult. To secure funding, I reached out to every organization you could think of and everyone was supportive, but no one could contribute funds. Eventually Best Friends Animal Society was able to help. Because Best Friends is involved with many legislative issues throughout the country, they had to make sure they would have the funding available and that success in South Dakota was actually viable. Because my wife and I had done a significant amount of groundwork and, basically, the only thing we were missing was a lobbyist, they were able to secure funding. Best Friends was also able to testify in both committee hearings on behalf of the bill. Where there any unexpected challenges that you encountered during this process? There were a few challenges. Most, if not all of the legislators, had never heard about breed specific legislation and when introduced to the idea of a bill that would prohibit breed specific legislation, they initially thought BSL did make sense because of their preconceived ideas about “pit bull” dogs. In addition, most legislators wrestled with the issue of local control. When that happens, the argument for local control comes into play to protect the peoples’ right(s) and privileges. Here, however, our bill was trying to give the people more rights, or at least preserve their rights, and, therefore local government doesn’t come into play. Moreover, most bills enacted into law affects local control, therefore, the argument that a bill takes away local control can be used on almost every bill. So the two main hurdles we encountered during the bill’s legislative process were the local control issue and the preconceived notion that certain dogs are dangerous. What advice would you give to other concerned citizens who would like to get involved with BSL preemptions in their states? My suggestion is to just get started and research the issue by reading and watching everything that is relevant. Getting a bill passed is hard; you have to do your homework. I would also start reaching out to individuals and organizations that appear would be supportive of the bill and whose support would be influential when the bill is in front of legislators. In our case, some of the local experts that we contacted were willing to reach out to their legislators and testify on behalf of the bill. This definitely helped the bill to pass. And put in face time. After SB 75 passed, I was told by a legislator that the time I spent circulating with legislators the previous year was beneficial because the legislators remembered visiting with me about the bill. Once the bill was proposed, the bill was no longer a secret and the media jumped on it, but, by that time, we had laid the ground work and it was time for the legislative process to do its thing. Congratulations on a job well done Jerry. Thank you for talking with us and for all your hard work! Are Dogs As Exceptional As We Think They Are?